Time for another week. Translation: time for coffee to get us through Monday morning. If you’re me, preferably some milky, sugary coffee, maybe with a little whipped cream. And chocolate. It is Monday after all, and Mondays are hard. Especially after you’ve spent the weekend meeting great people at a great food blogger conference at Stonewall Kitchen and you’re not quite ready to be thinking about your day job, which is not food blogging. I’ll probably talk more about the conference soon, but for now, let me just thank Alana and Amy of Blog Better Boston for putting it together! I was never a big coffee drinker until this year (and at 3-4 cups a week, I guess most of you still wouldn’t say I qualify as a big coffee drinker). I’ve always liked coffee – the flavor, warmth, etc. (again, since by coffee I mean lattes with three packs of sugar, some of you might judge me – I’m OK with that), but I’m super sensitive to caffeine. One cup of Starbucks coffee and I’m shaking, my heart is racing, and I can’t focus on anything. Not exactly the desired effect. But when I’m really dragging, one warm latte is just the thing to get me going. This is another recipe from Home Made Winter, which I reviewed last week. Doesn’t it just look like the perfect thing to warm you up on a cold day? I adapted the recipe a little bit to use espresso instead of coffee, since I don’t have a regular coffee pot (in fact, I don’t have any coffee-making equipment – I had to borrow Trevor’s bialetti for this one! A great little tool, by the way.) I also used skim milk, instead of whole, since I wasn’t feeling that indulgent. 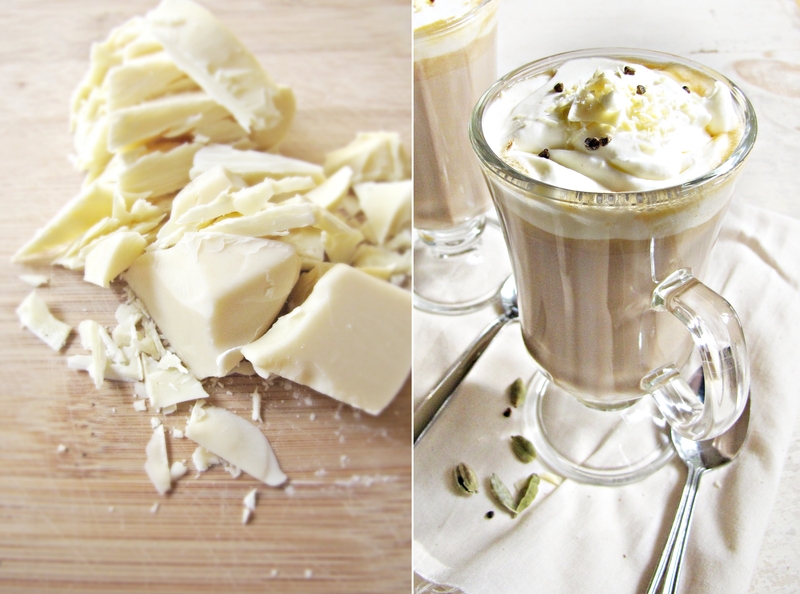 Because the recipe has you melt white chocolate into the warm milk, and slightly sweeten the whipped cream, I didn’t even need any extra sugar – I know, I’m a hero right? Hope everyone enjoyed their weekends, and have a great Monday! Recipe adapted from Home Made Winter. Serves 2. Note: Original recipe calls for a smaller volume of whole milk and a larger volume of regular coffee (1 c. milk, 3/4 c. coffee for 2 servings). Since I wanted to use espresso and have this be more like a latte, I increased the amount of milk and used a shot of espresso per glass, but I’m sure either way would be delicious. I also don’t love the flavor of cardamom, so I made it optional, but include it if you like the flavor! Heat the milk over low heat in a medium saucepan, stirring with a wooden spoon. As soon as it begins to simmer. Remove from heat and add the chopped chocolate. Let sit for 5 minutes, then stir again. If the chocolate is not fully melted, heat gently for 1-2 minutes over low heat, stirring. In a small bowl, whisk cream until it begins to foam. Sprinkle cream of tartar over the top, then whisk vigorously until soft peaks form. Add sugar and vanilla, and whisk to incorporate. Divide hot espresso between two glasses. Top each glass off with the warm milk and chocolate mixture, and stir to mix. 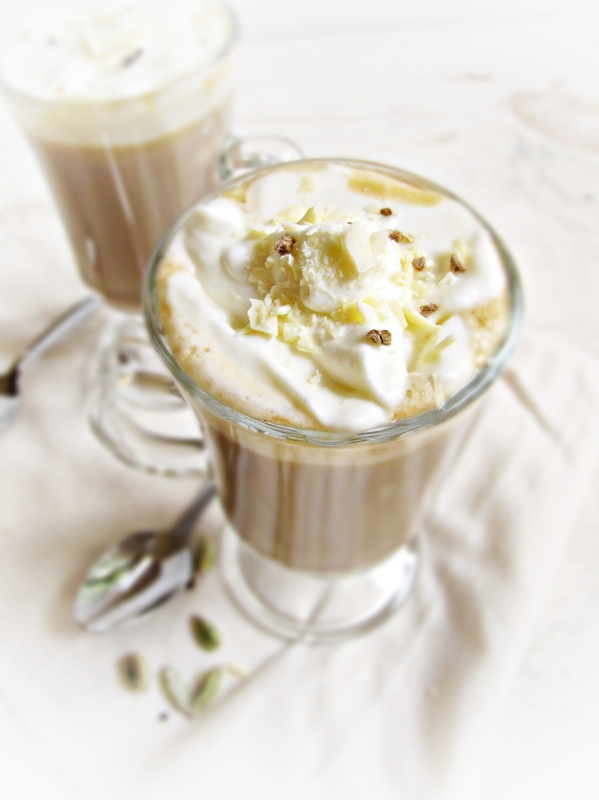 Top with whipped cream, any extra white chocolate shavings, and ground cardamom, if using. Enjoy while hot! Seriously amazing photos. Makes me want one. RIGHT. NOW. So happy you enjoyed the Food Summit! Thanks, Amy! And thanks again for all the hard work you put into the food summit! I’m still telling people about how great it was. This looks amazing! I think I would need 2!